Every day, our police stand between us and danger, guard our families, schools and our businesses, and truly serve to protect our well-being and that of our communities. Say thank you to a special friend or provide special recognition to a heroic policeman or policewoman in your family by giving the gift of this specially engraved Daisy Red Ryder BB Gun. 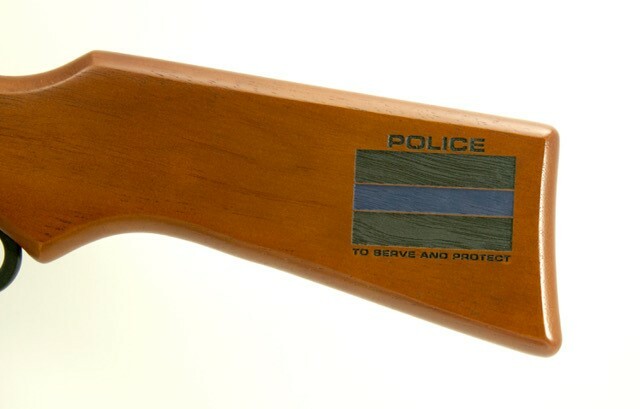 The stock is engraved with a classic blue line graphic above the slogan, "To Serve and Protect." Price includes engraving a name, rank or position and name of department on the forearm.